There are a variety of recipes available online of Tadka dal, but the one I am writing about is one of the popular dishes in Bengal. Outside Bengal, whenever I ordered for tadka dal, I was served a range of different dal tadka preparations, most of which were made of yellow lentils. 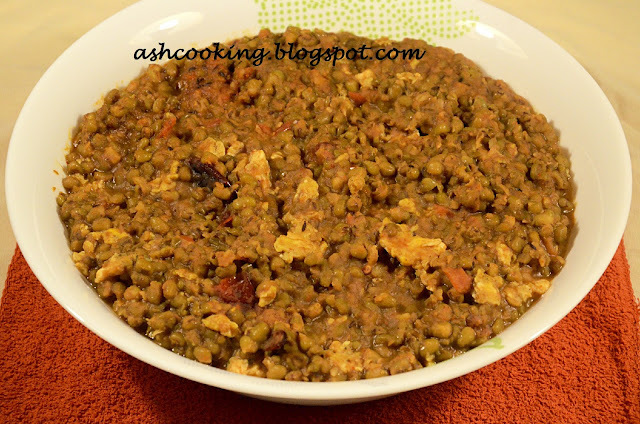 Interestingly, in Kolkata tadka dal is a dish made exquisitely in typical Dhaba style...spicy with different types of flavour (egg, chicken or mutton) to suit any palate...and the dal that is used for this preparation is not yellow lentil, but whole green moong dal. This tadka dal curry is ideal to have with rotis. In Kolkata we used to team it up with romali rotis. 1. As mentioned above, soak dal overnight and then pressurecook it with one whistle. Now, keep the dal aside. 2. Add cumin seeds and dry red chillies into the smoking oil. When they will begin to splutter, add onion paste and tomatoes and fry till they turn golden in color. Add ginger paste and green chilli paste and roast them for a while. Then add all the spices and saute for about 7-8 minutes. 3. Now add the boiled green moong dal. 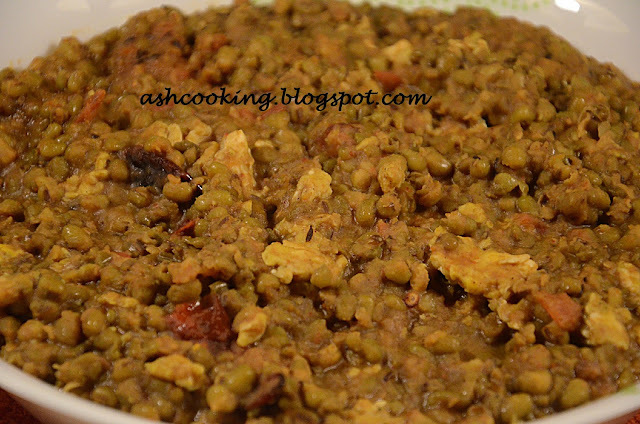 Since the lentil is already made tender by pressurecooking, just keep it on oven for 5 minutes more till the spices get well mixed with the dal. Add salt tastewise. 4. Now in a separate frying pan, make scrambled egg and mix it with the dal. Your egg tadka dal is now ready to be served. Awesome :-) I just love this! !